Let’s be real: 2018 has been a *very* long year. At times, it felt like the bad news wouldn’t stop, and that the challenges the world was facing were too big to take on. But amidst it all, ONE members rallied together and decided to tackle some of these problems head on, and their work has paid off in incredible ways. For ONE members, 2018 wasn’t a year of turmoil. It was a year of triumph. While others were bickering, we built bridges. While the world was coming apart, our movement centered around coming together. While all of us felt outrage, ONE’s members turned it into action – 1,317,462 actions to be exact. Thanks to the work of passionate people around the world, we made 2018 a year of victories. At a time where it seems like governments are too divided to get anything done, ONE members rose to the occasion and achieved some major wins in the political arena. For the past two years, activists in Nigeria campaigned to Make Naija Stronger. The campaign demanded better,more accessible healthcare in the country and the long-fought battle paid off! The Nigerian government have committed to a budget of N55.1 billion (US$153 million) for basic healthcare provisions, giving citizens easier and more affordable access to healthcare services. To make this win even bigger, there will be increased transparency in how these funds are used. The United States also scored an incredible political win with the passing of the BUILD Act, which will bring US$30 billion in private sector dollars into the fight against extreme poverty. The bipartisan bill was backed by 78,000 petition signatures, which were hand-delivered to offices in every single state. We asked you to tell world leaders that #GirlsCount, and you delivered by creating 64 hours of footage and committing 750,000 signatures! World leaders at the Global Partnership for Education (GPE) Summit committed over US$2.5 billion towards getting 13 million girls back in school! The good news for women and girls didn’t stop at the GPE Summit. 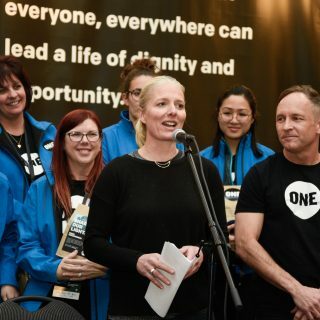 At the G7, 146,000 ONE members signed a petition and told G7 leaders to invest in women’s economic empowerment. Together, leaders of the G7 countries invested CAD$3 billion (US$2.24 billion) towards women’s economic empowerment. Additionally, Canada committed to CAD$3.8 billion (US$2.9 billion) to education with a focus on girls. For the second year in a row, the Trump Administration proposed cuts to foreign aid. And, for the second time, ONE members told their representatives, democrats and republicans alike, to prevent these cuts from happening. Thanks to their efforts, all US poverty-fighting programs will be fully-funded in 2019. Next year, the EU will be deciding its long-term budget priorities for the following seven years. 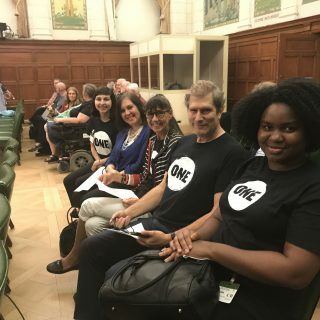 Members are already standing up to tell EU leaders to support the fight against extreme poverty, and we’ll continue to advocate for this important budget in the new year. 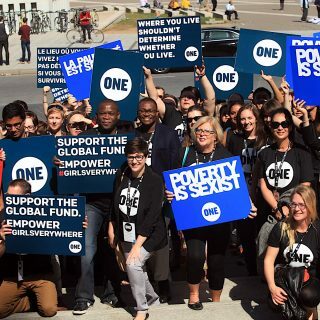 We continued to say it loud and proud: Poverty is Sexist. We said it so much that the message traveled farther and wider than years past! Activists, everyday citizens, youth, celebrities, and influencers rallied in support of women and girls everywhere. In fact, nearly 250,000 people signed our open letter to share our crucial message with the world. Today, many barriers still prevent girls and young women across the globe from achieving their dreams and rising out of extreme poverty. That’s why we put a spotlight on these barriers with our International Day of the Girl video. The video got more than 6 million views, becoming our most successful video ever! Connie Britton made a bold statement by wearing our declaration about poverty front and centre on the red carpet at the 2018 Golden Globes! Chadwick Boseman also represented our message, wearing our “none of us are equal until all of us are equal” t-shirt at a rally in June. PLUS, Phoebe Robinson rocked the same shirt for an interview with the NYTimes Style Magazine in October! Nigeria’s youth are taking control with the VoteYourFuture Campaign. This campaign is encouraging young people to participate in Nigeria’s 2019 elections, and pushing for them to vote on policy, not sentiment. The campaign kicked off in a big way with over 3,000 youth turning up for the launch event in October! We’re also expanding our on-the-ground work in Africa, including a brand new office in Dakar, Senegal! Spoiler alert: expect big things from our incredible Senegal team in 2019. What do all of these accomplishments come down to? Everyday people like you who committed to empowering other people and demanding equality by standing up, raising your voice, signing petitions, sending emails and tweets, meeting with representatives, and advocating for our causes with heart. Don’t miss out on everything we’ll accomplish in 2019! Become a ONE member and take part in the action! Thankful for our wonderful volunteers!